I have to say, and no pun-intended: Into the Spider-Verse is a total marvel, all the way down to its stylish and diverse styles of animation to its bold, sophisticated storytelling. The visuals are absolutely enchanting. Fast, colorful, and distinct. Something Sony Animation always nails is how each character has a pronounced look and movement. With the various kinds of Spider-Men and Marvel villains featured in this story, the animators went all out to give them a unique identity. Notably in this case are Spider-Man Noir, Peni Parker, and Spider-Ham. 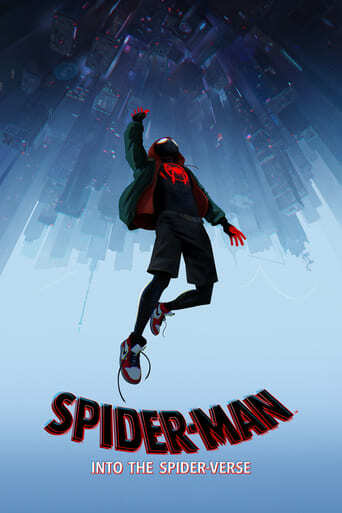 Noir, whose universe takes place in 1930s New York, boasts a dark, shadowy vibe similar to Sin City, Peni Parker has a bubbly anime look, and Spider-Ham is a bouncy, eccentric cartoon character who takes full advantage of his absurd existence to deliver some of the film's best laughs. Even with these different identities, the film slows down to balance their character in a serious nature. Heck, one of the most hard-hitting, poignant lines is spoken by Spider-Ham, the breakout comedic relief.Miles and a majority of characters share the same art style. I really enjoy the blend of 3D models with traditional 2D movement. It's very appealing to watch and it seamlessly matches the comic book theme. I also appreciate the stylization of certain villains. Kingpin is a character I don't think was portrayed accurately outside of the comics, just appearing as a generic, heavy-set bald brute, when he's really an enormous, borderline non-human tank. Kingpin looks excellent in this film, with his titanic body and small head with an intimidating grimace. He's a powerful force and a legitimately scary antagonist. Doc Ock is another example, portrayed as a brilliant, but outlandish female scientist with a psychotic passion for villainy. I didn't feel like I needed to know more about her character, she was such a fun villainess to watch. She really added to the suspense in some action sequences.I really loved the story. I thought it was rich with charm and thrills. Granted, I did notice some familiar elements that are done to death in superhero fiction and the animation canon alike, such as surprise villain reveals and major character deaths that were obviously seen coming, and I certainly wish some characters (espeically Miles' uncle) had more screentime, but there's one fact that overshadows these flaws for me: The writing is mature. First of all, it's a Sony Animation product. If you look at this company's past work, some of it is very soulless with its marketing and panders to its audience with incessant pop culture references and juvenile comedy. Into the Spider-Verse is a welcome departure. Passion and integrity was put into this project. The writing is very grounded and treats its audience like people who want to see a genuinely captivating flick. Heck, the first third of the film is somewhat slow and nonchalant, almost like an arthouse film. I've never had such a cool, yet off-beat and engaged feeling while watching an animated film on the big screen. Nothing was forced, nothing felt out-of-place, nothing took me out of immersion. The tone and pacing is very adult, even when something excessively goofy like Spider-Ham is on-screen. It's like the Marvel Cinematic Universe. It can be dark and distressing, but lighthearted and amusing. There's a perfect balance and it never sacrifices integrity just to appeal to a niche audience. Well...there is that after-credits scene, but it was quite hilarious, so I let it pass.That's the most I can say without spoiling a lot of the film. I want you to see this absolute marvel with your own eyes. To close, Into the Spider-Verse is everything I hoped it would be. This is a game-changer for both superhero filmmaking and animation altogether. Sleek, colorful, funny, emotional, frenetic. This film skillfully balances all these elements. There is never a moment that felt forced, it never talks down to the audience. It's a mature and stylish take on the Spider-Man mythos, and perhaps the best big-screen Spidey picture to date with some of the best animated visuals you'll ever see. I didn't have a single issue with this film. I was dazzled and moved throughout. Sony Animation, if this was your apology for The Emoji Movie, then apology goddamn accepted. Massive bravo! Downloading Seeding Spider-Man Into The Spider-Verse (2018) [WEBRip] [720p] [YTS.AM] from to 0 peers.